Char Dham, literally: 'the four abodes or seats' are the names of four pilgrimage sites in India that are widely revered by Hindus and other secular religions. It comprises Badrinath, Dwarka,Rameswaram and Puri and considered highly sacred by the Hindus to take this pilgrimage during one's lifetime. The Char Dham as defined by Adi Shankaracharya consists of three Vaishnavite and one Shaivite pilgrimages. So, get on board a divine journey on the `Char Dham Pilgrimage Package’! You could choose your mode of travel from a plane, train, car, or bus, depending on your base! Badrinath became prominent when Nar-Narayan, an incarnation of Vishnu did `tapasya’ there. At that time that place was filled with plum trees. In Sanskrit language they are called Badri, so the place was named Badrika-Van, that is, the forest of Plums. The particular spot where the Nar-Narayan resided was therefore called Badri-Nath or the Lord of Plum forest. This all happened in the Sat-Yuga, so Badrinath came to be known the first Dham. The second Dham, Rameshwaram got its importance in the Treta-Yug when Lord Rama built a Shiv-ling here and worshipped it to get the blessings of Lord Shiva. The name Rameshwaram means "the God of Lord Rama", though Rama himself is considered an incarnation of Lord Vishnu. The third Dham, Dwarka got its importance in Dwapar Yug when Lord Krishna, another incarnation of Lord Vishnu, made Dwarka his residence instead of Mathura, his birthplace. The fourth Shankaracharya Peeth(Seats) at the Char Dham school of Hinduism, created at least four Hindu monastic institutions. He organised the Hindu monks under four Mathas (monasteries), with the headquarters at Dwarka in the West, Jagannatha Puri in the East, Kamakoti Peetham in the South and Badrikashrama in the North. 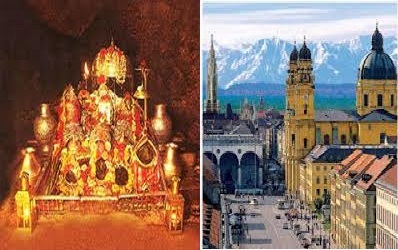 So Kedarnath is considered as the pair of Badrinath, Rangnath Swami is considered the pair of Rameshwaram. Somnath is considered as the pair of Dwarka. 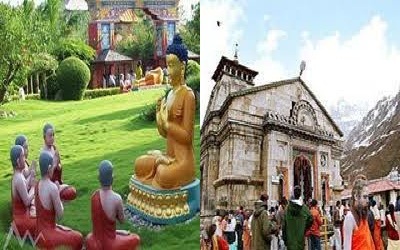 However one thing is also to be noted here that according to some traditions the Char Dham are Badrinath, Rangnath-Swami, Dwarka and Jagannath-Puri all the four of which are Vaishnav sites and their associated places are Kedarnath, Rameshwaram, Somnath and Lingaraja Temple, Bhubaneswar(or may be Gupteshwar) respectively. 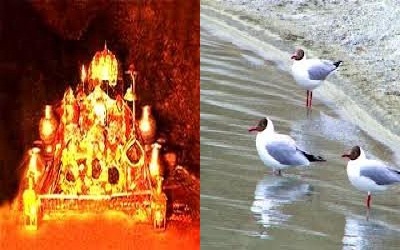 Add on to your knowledge about the ancient Indian mythology zone on this `Char Dham Pilgrimage Package’. Badrinath is located in the North Indian state of Uttarakhand. 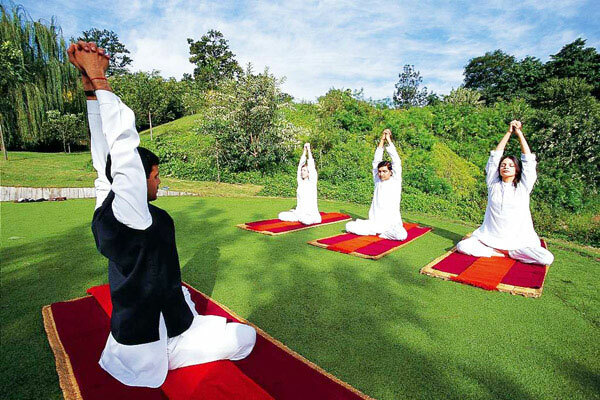 It is in the Garhwal hills, on the banks of the Alakhnanda River. The town lies between the Nar and Narayana mountain ranges and in the shadow of the Nilkantha peak the presiding deity is a meditating Lord Vishnu in black stone. 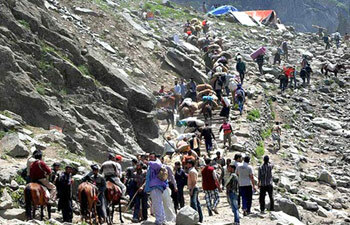 Traditionally the yatra to Kedarnath is undertaken before coming to Badrinath. For the devotee who has been unable to do this, the temple of Adi Kedareshwar nearby is to be visited first. The original Badrinath Temple built in the time of Adi Shankaracharya, has been rebuilt several times due to avalanches and snowfall. The five-day winter closing ceremony is an annual ritual. The temple doors are reopened at the onset of summer, when devotees come for the sacred Jyoti Darshan. Special pujas are performed by the rawal, before the temple is opened to the public. Regular `aarti’ is performed at the temple! Drown yourselves in the chanting of prayers with the sparkle of diyas on this Char Dham Pilgrimage Package! Rameswaram located in the South is in the Indian state of Tamil Nadu. It is situated in the Gulf of Mannar at the very tip of the Indian peninsula. According to legends, this is the place from where Lord Rama, built a bridge Ram Setu to Lanka. The Ramanatha Swamy Temple dedicated to Lord Shiva occupies a major area here and it is believed to have been consecrated by Shri Rama Chandra. The site is significant for the Hindus as a pilgrimage to Banaras is incomplete without a pilgrimage to Rameswaram. The presiding deity here is in the form of a Linga with the name Sri Ramanatha Swamy and is also is one of the twelve Jyotirlingas. The main temple is a grand edifice and the ocean is alluringly gentle, stretching away into the horizon as if it were a particularly large lake. It is salt in the air and the fishing boats that remind you that this is also a beautiful village by the sea. Pilgrims abound here, though besides spirituality, the blue sea, the delightful scenery and the drive to Dhanushkodi or Punyatirtham, the holy waters where the oceans meet,are the other reasons to head out this far! A jolting ride through desolate sands will help you reach Land’s End, where on one hand, is a maginificently fierce Gulf of Mannar and on the other, is the deep, mesmerizing blue of the unbelievably gentle Bay of Bengal! Visitors often expressed that Dhanushkodi felt as if such a landscape could not exist on this earth, but dredging for the controversial Sethusamudram Canal Link Project may have already changed this panorama! 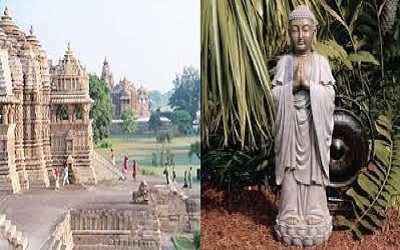 Dwarka located in the west, is in the state of Gujarat India. The city derives its name from the word "dvar" meaning door or gate in the Sanskrit language. It is located close to where the Gomti River merges into the Gulf of Kutch. However, this river Gomti is not a tributary of the Ganga River. This legendary city was the dwelling place of Lord Krishna. The Dwarkadheesh Temple also known as the Trilokasundara Temple, built in Chalukhya-style with local stone is attractive enough to catch your eye! The `aartis’ here with resonating drums; cymbals and bells are quite special! A short walk from the temple is a lighthouse with stunning views! Other temples here include the Siddheshwar Mahadev Mandir, Bhadkeshwar Mahadev Mandir set enchantingly upon a rock in the sea, and the Rukshamanee Mandir rested by a breezy stretch of backwater. Catch a ferry at the jetty at Okha to reach Beyt Dwarka, an island that is home to Dwarkadheesh ka Mukhya Mandir, a charming place. The Nageshwar Temple is believed to host a revered jyotirlinga, in the Lord Shiva revealed himself as a column of light! 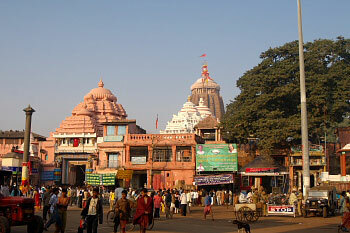 Puri located at the east, in the state of Odisha, India and is one of the oldest cities in this part of the country. It is situated on the coast of the Bay of Bengal. The main deity is Shri Krishna, celebrated as Lord Jagannatha and this is the only shrine in India, where goddess Subhadra, sister of Lord Krishna is worshipped along with her brothers, Lord Jagannatha and Lord Balabhadra. The main temple here is about 1000 years old and constructed by Raja Choda Ganga Deva and Raja Tritiya Ananga Bhima Deva. Puri is the site of the Govardhana Matha, one of the four cardinal institutions or Mathas established by Adi Shankaracharya . Brahma, Vishnu and Maheswara , the trio are always together at all-times and in every place. In Kali Yuga, Sreemandir existed as Jagannath temple in Puri along with the pairing of Jagansnath-Vishnu, Balabhadra-Maheswara and Subhadra-Brahma. This is the plume for Oriya people to celebrate a special day in this Dham which is known as Ratha Yatra ("Chariot Festival"), when the deities of the temple come out on chariots to mingle with their devotees, the largest congregation after the Kumbh Mela! Try to reach for this stunning panorama on the Char Dham Pilgrimage Package! As the sun rises over the Bay of Bengal and the massive stretch of sandy beach, fishermen toss their dinghies into the choppy waters and Patitapaban, the flag atop the majestic Jagannath Temple, flutters in the sea breeze. It is then that Puri wakes up to its different roles, as an important spiritual centre, the most visited tourist destination in Orissa, with devotees, Indian tourists and foreigners flocking in, the not-so-small seaside town combines the holiness of the pilgrimage spot, the energy of a tourist centre and the laidback charms of a beach resort! The sea known as Swargadwar or Gateway to Heaven is considered a sacred spot with the sunrise being gorgeous at dawn, and the evenings coming alive with vendors and tourists. You may look out for famous sand monuments by a leading sand sculptor of the State, also an expert in carving sand castles! Do not miss the bhog from the world’s largest kitchen at the Jagannath Temple, with the kitchen serving saatvik food, no onion, garlic, potato, tomato, spices, is quite divine! Intrigued by his looks, which can be described as totemic, scholars have variously traced the Lord’s deification to `a primitive folk cut of tree worship, the esoteric practices of tantra, the meditative approach of the Buddhists…..the comprehensive religion of Vedantism. Besides the Sri Jagannath Temple, numerous smaller temples, mutts and religious institutions are located, such as the Gundicha Temple, temple to Ardhasani or Mausi Ma and the Loknath Temple. 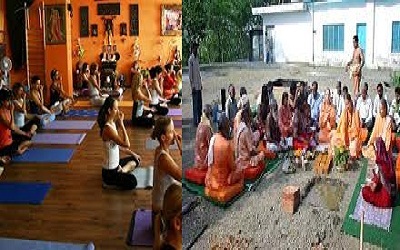 The Sri Chaitanya Gaudiya Math here is an important institution for the Krishna devotees. Badrinath being a religious centre, tourists would find small souvenirs, idols of deities, religious articles and music CD’sfrom the shops or stalls lining up the area! Ofcourse, plastic bottles are sold for carrying Gangajal on all the four dhams! In Rameswaram, shell-based handicrafts, wall hangings, chandeliers, jewellery decorative mirrors are sold in a row of shops, to be bought as souvenirs, as well as deities crafted in stone, metal and wood. In Dwarka, you could find souvenirs of various religious deities in metal craft, wood, stone, and other intricately crafted metal works. As well as textile products and embroideries with each stem telling a story….. Of camels, peacocks, parrots, flowers and trees. The Bada Danda in Puri is lined with shops that sell puja items, remarkable religious maps representing traditional pilgrimage sites in concentric layers of conch shells, soapstone, seashell, pattachitras or paintings with mythological themes, and solapith or soft wood sculpture items are unique buys. In textiles, double ikat locally called `cuttack’ is most famous as is the gold embroidered work from Sonepur and authentic ikat saris from government cooperatives. In Badrinath, for food, the accommodation package has a variety to offer for daily meals, containing traditional vegetarian fare, thalis and a-la-carte. In Rameswaram, the idli-dosa basics are sold everywhere as also piping hot tiffin items or full meals served on a banana leaf. Ofcourse, the place is adequately equipped to serve North Indian, Chinese and Continental cuisine to cater to varied Indian and International tastes! In Dwarka, you could get to taste home-style Gujarati food and also other Indian, Continental and Chinese cuisine, vegetarian, as well as dishes cooked on request by International tourists! The Ananda Bazaar in Puri has been justly dubbed as the best food complex in the world, offering the famous chhappan bhog or fifty-six dishes, of six-fold tastes during day and night. Close to the temple, savour the no onion, no garlic, Oriya thali and a delicious lassi. Mughal and Chinese delicacies are also available as well as dosas, idlis and dishes with Bengali recipes! The deluxe hotels could provide with customized continental and European dishes! Badrinath may be visited during the spring, summer or autumn season as heavy snow falls may lead to road blockages in the thick of winters, and it would be advisable to review weather conditions before leaving for this particular site as sometimes rainfall also may lead to closure of roads! Rameswaram is recommended throughout the year in its individuality but in combination with Badrinath would coincide between Septembers to March, the very best season! Dwarka is recommended throughout the year, but the ideal season would be September to March, though the temperatures may be slightly warm, except in the winter months. Puri also bears a tropical climate, and the visiting season could be September to March, again with slightly warm temperatures, except in the proper winter months! This religious journey could open your mind and soul to an avenue of spirituality and rare conscientiousness, combined with some fascinating sights, perhaps wanting you to return back on the Char Dham Pilgrimage Package!